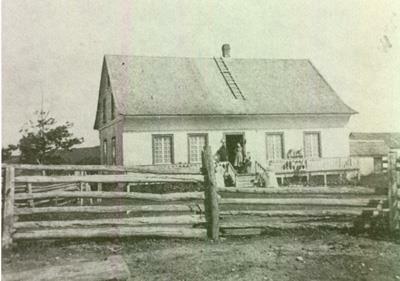 An early photo of the house Michel Saindon built upon founding the village of Cacouna. Maison Michel Saindon also served as Chapel House (1789-1809). Photo courtesy - Andre Saindon. When I emailed Andre that we would spend the night in Cacouna he suggested this B & B. It's the location of the house of my founding father of Cacouna. What luck! Photo Courtesy - Andre Saindon. 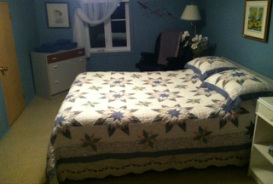 One of two bedrooms in the Bed and Breakfast we stayed at the home's original location of our ancestor, Michel Saindon. Cousin Andre offered in his broken-English, "Initially I put them on guard not to fear if by chance Michel Saindon [during] the night to [pull] their toes ... this is not malice but a tease." This house is on the same location as the house above - 1073 Patrimoine. It is now owned by Jean and Louise Saindon who share it with guests as a charming, clean and highly recommended Bed and Breakfast. 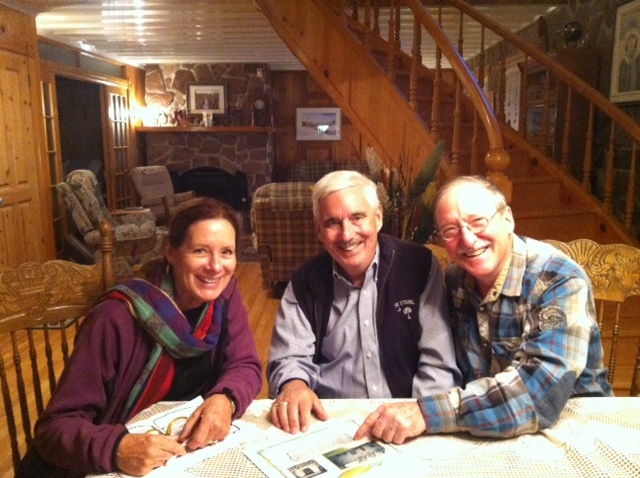 "Cacouna is the Mecca for all North American Saindon's", distant cousin Andre Saindon tells Linda Roy Cross. 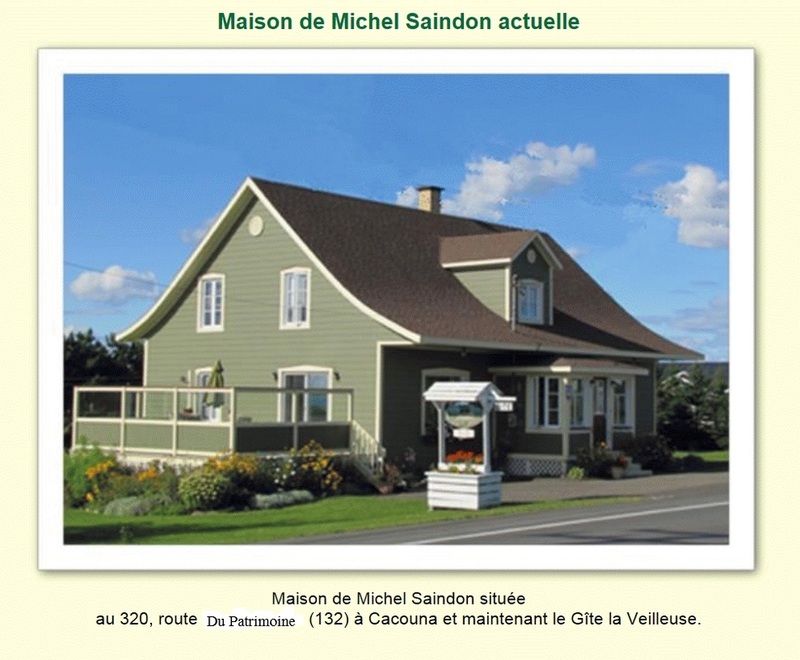 Both are descendents of Michel Saindon, the founder of Cacouna, Quebec. Andre invites us into his home. In Andre's words, "I [gave] copies of papers and posters to better visualize the travels of Michel Saindon from Brittany, [France] to Cacouna. Naturally, I could not ignore the deportation of the Acadians - the sole cause of the arrival (and survival) of Michel Saindon to Cacouna. [With this information and Michel's desire to have a stable family life, he decided to flee west.] Sometimes wisdom tells us that there is no shame in "The salvation of flight!" Facing the house and to the right is this bronze plaque in memory of our ancestor, Michel Saindon and commemorating the founding of the Association of North America Saindon. Several times each year Andre Saindon and his wife dress in period costumes to tell the story of Michel Saindon, the original founder of Cacouna. 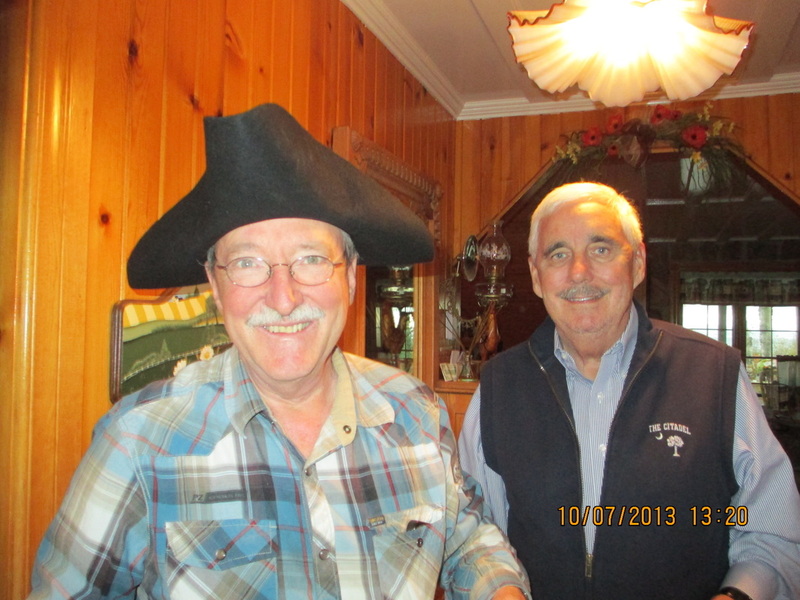 Andre Saindon showing the hat he wears during re-enactments in his role as Michel Saindon. Randy Cross looking on. 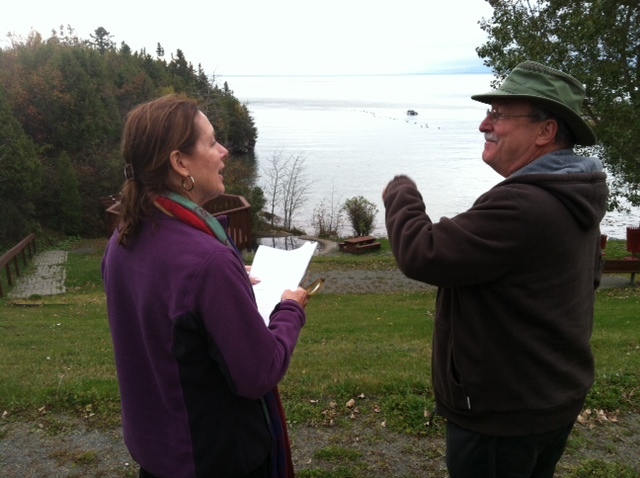 Andre explains that Michel Saindon built his house in the lowland near the dock. A few years later moved to the top of the hill. He also tells how Michel Saindon built aboiteaux (sounds like ab-b-toe) - dykes with sluice-gates that allow flood water to drain but keeps the sea water out. This is a technique learned in France to channel water from the St. Lawrence for his crops. For detailed information click on this photo to go to http://www.novascotia.ca/agri/rs/marsh/geninfo.pdf. The story continues with the famous Cacouna early in the century as the site spa. It would appear that the saline water is beneficial for health and skin. "Many homes were built by wealthy families still bearing witness to the big time." "I, Michel Saindon, came from Bains Oust in Britain in 1736 to establish myself in Acadia (Nova Scotia). In the spring of 1736 I arrived in Port-Royal (Grande Pre). Then that fall I went to Sainte Anne of St. John River (Fredericton, New Brunswick) to take charge of the estate of the late Gabriel Godin dit Bellafontaine. "I married Marie-Yves Godin dit Bellefontaine, daughter of Gabriel the next year. We had nine children (five girls and four boys - Louis, Pierre, Charles and John.) In 1763 during the great deportation in Acadia I fled with my family to come to Cacouna. "I arrived here August 7, 1764 making me the first landowner of the place. I exercised the duties of notary and land until my death." 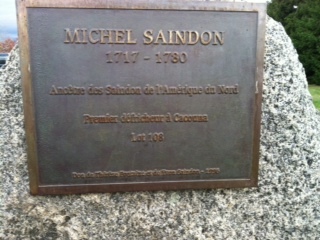 Michel Saindon died October 23, 1780 in Kamouraska. His wife, Marie-Yves died April 2, 1795. Throughout his life he did his best as a father, and in his profession of notary, and as pioneer and farmer. After his death his house was used as a Chapel House from 1789 - 1810 until the first chapel was erected November 25, 1810. Andre writes, "A big thank you to the Saindon Association of North America for all research and commemorative plaques. finally, to commemorate the 15th anniversary of the Association, the planting of a tree is a tangible sign that the genealogy of Saindon was indeed rooted in the soil of Cacouna." 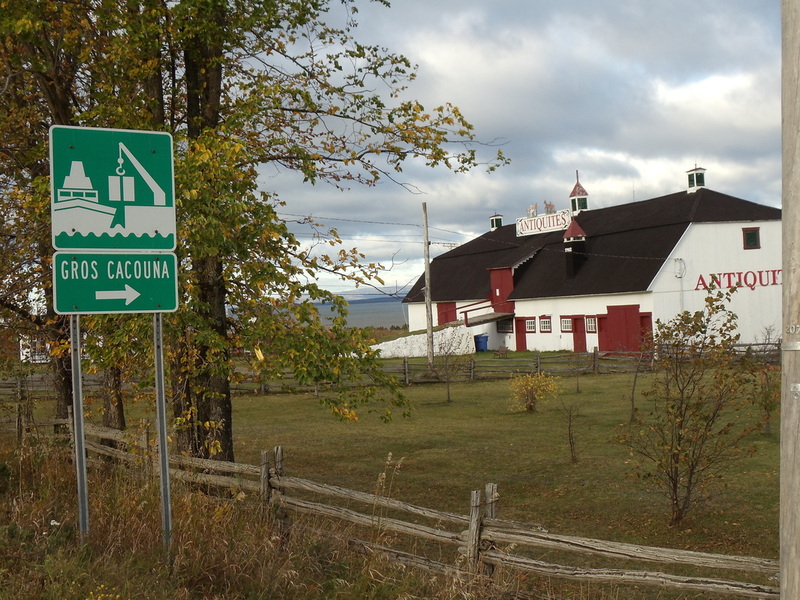 The sign in the foreground shows the historic site of what was once a harbor in Cacouna. 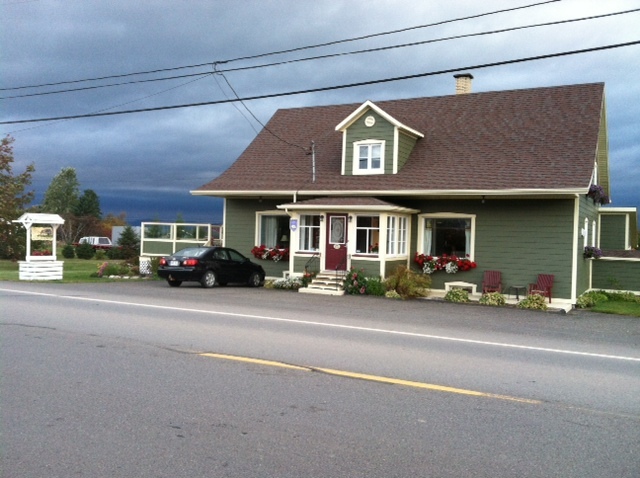 The Antiques store in the background is the location of a barn that was painted/white-washed in days of old. Sailors looked for this landmark. The government currently offsets the cost of painting the barn white in keeping with it being a historical site. 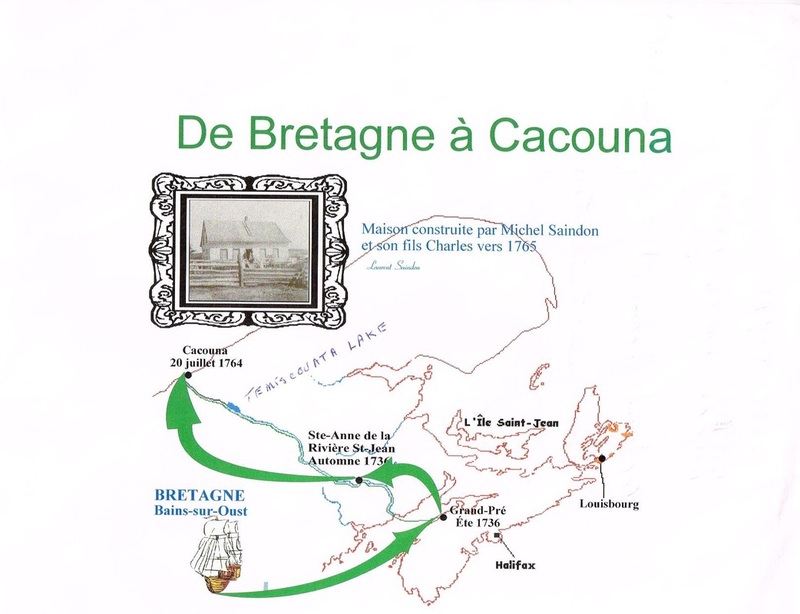 Map provided by Andre Saindon shows the route Michel Saindon took upon leaving Bretagne, Bains-sur-Oust. Sailed to Grand-Pre around 1736. Traveled to St. Anne de la Riviere St. Jean the autumn of 1736. [Following the deportation he arrived - escaped to Cacouna July 20, 1764. Courtesy of and translated by Andre Saindon: "The year of grace, 1715, the second day of December. I the undersigned, curate of the parish church of Bath, have named a son that day. 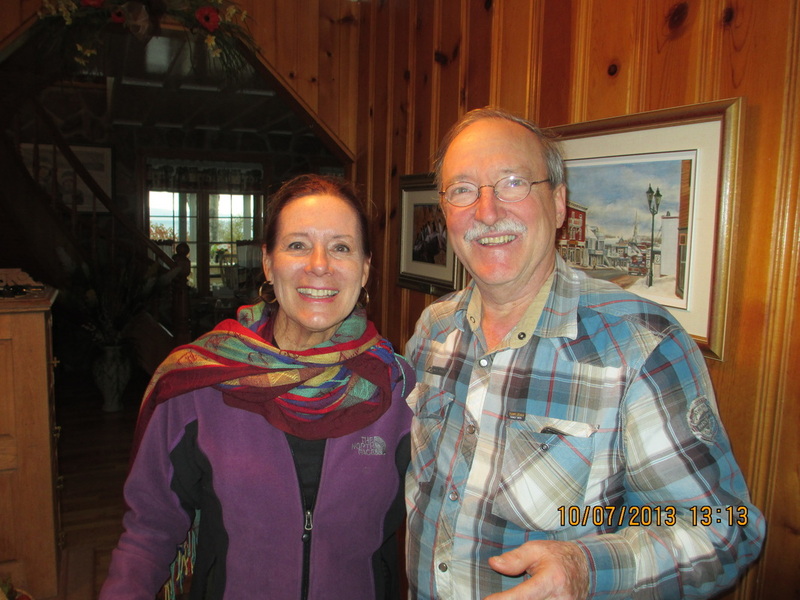 Peter and Mary Mark Saindon woman farmer of this parish, who has been given the name Michael. The godfather was Michel Martel, shoemaker and godmother Jeorgine Jolivet that sign. J. Pasty, priest. 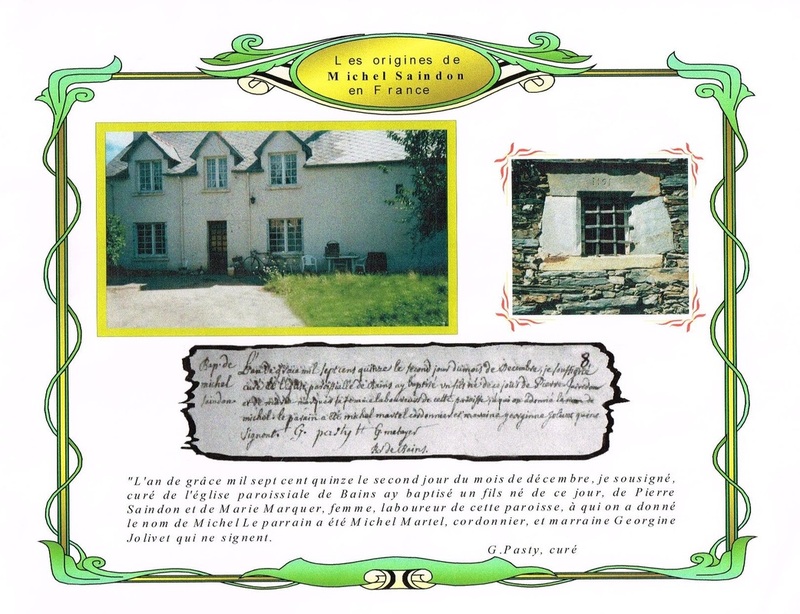 The house in the photo is believed to be where Michel Saindon was born with the barred window to the right as proof." Map of France. Michel Saindon lived in Bretagne - the yellow shaded area in the upper left. 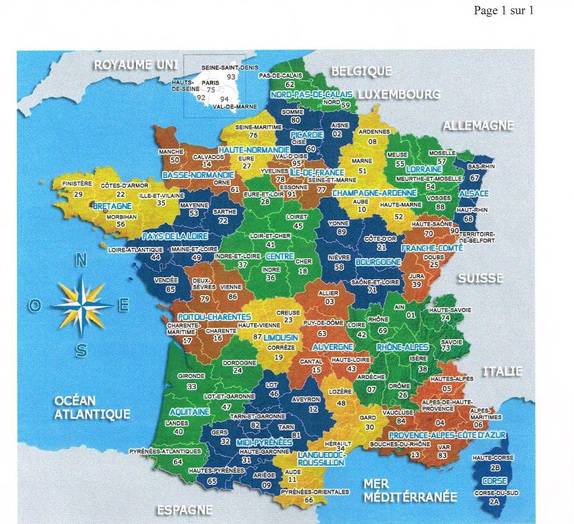 HIs place of birth is the black dot by the B in Bretagne.